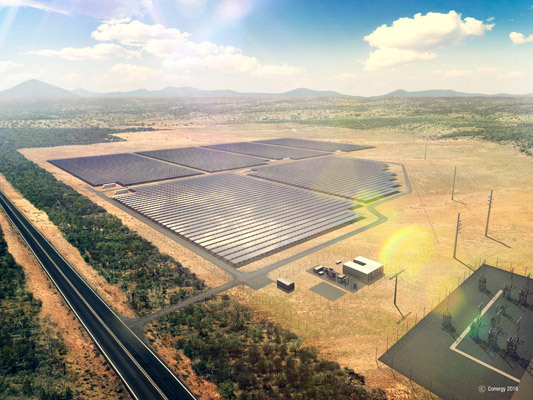 Artist's impression of the Lakeland solar and storage plant in Queensland. Queensland’s Renewable Energy Taskforce isn’t just confident 50 per cent renewables is possible by 2030, it also believes it will be “cost neutral” for Sunshine State consumers, according to its just-released draft report. The draft Credible Pathways to a 50 per cent Renewable Energy Target for Queensland report finds the state will need 4000-5500 megawatts of large-scale capacity between 2021-2030, and provides three post-2020 pathways to get it – a linear pathway of incremental renewable growth, a rapid pathway where most capacity will occur closer to 2030 to take advantage of cheaper prices, and a “Stronger National Action pathway”, where the federal government pulls its finger out to reduce electricity sector emissions. The kicker is that this any of these options could be done without adding any net cost to consumers. “This is due to additional supply from new renewable generators placing downward pressure on wholesale electricity prices which is projected to offset the payments to renewable projects,” Queensland energy minister Mark Bailey said, calling the report “a groundbreaking development”. However, the report said this outcome was not guaranteed, and could be affected by things like coal-fired generation being withdrawn from the market. Other benefits include more than $5 billion going to the gross state product, $7 billion in investment, and associated jobs, particularly in regional Queensland. “This includes a net average increase in employment of around 6400-6700 direct and indirect jobs per annum between 2020 and 2030,” Mr Bailey said. Aside from affordability, Mr Bailey also said security had been central to the draft report, which found the target could be met while maintaining reliability – a finding at odds with recent federal government rhetoric on renewables following the South Australian storm. The report shies away from state-based policy mechanisms like a carbon price to stimulate investment in favour of reverse auctions for Contracts for Differences. There will be $0.9 billion in subsidies expected to be paid to renewables under the linear pathway, or $0.5 billion under the ramp-up pathway. The report doesn’t expect any coal generation to be retired under these two pathways – with Mr Bailey saying coal would still play a “significant role” in the generation mix – though about 1500MW would be retired if strong federal action were to be taken. The Queensland government this week came under attack by environmentalists for its support of coal, following its announcement that Adani’s Carmichael mine development would be declared “critical infrastructure” in an attempt to fast-track it. Rooftop PV is also expected to grow significantly by 2030, rising from 1500MW to about 5000MW, with greater opportunities for the commercial and industrial sectors. No additional financial incentives are expected to be needed for this to occur. The report findings were welcomed by the Australian Solar Council, whose president Steve Blume said the target was “affordable, ambitious and achievable, but also necessary to meet our national and international obligations”. “Residential, commercial and large-scale solar and energy storage will be fundamental to achieving 50 per cent renewables by 2030 and this report shows how we can build Queensland as the Solar State,” Mr Blume said. The Taskforce is led by former Macquarie Bank head of energy and utilities Colin Mugglestone, University of Queensland physics professor Paul Meredith, Climate Council chief executive Amanda McKenzie, ACIL Allen Consulting’s chief executive Paul Hyslop and MinterEllison advisor Allison Warburton. “The panel will soon undertake a second round of community consultation before delivering its final report to government by the end of the year,” Mr Mugglestone said.